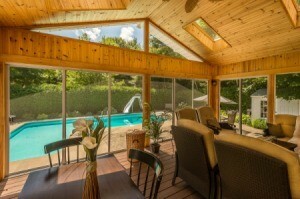 When choosing flooring for a screened porch you will want to find the best option for this semi-enclosed outdoor space. This is a guide about best flooring for a screen porch. I have a covered porch that is screened in top to bottom. I need to replace some indoor/outdoor carpeting that is there with something else; it is over concrete. Is tile hard to install, and is there a special kind I need to use outside? Does anyone have any other ideas as to what I could put there? I am not a fan of carpeting outside. Thanks. My folks always just painted their porch floor when it was screened from top to bottom. Our neighbors either did that or put vinyl or linoleum down on theirs. It kind of depends on how fancy you want it. From different decorating shows I watch on TV, it looks like when they lay tile they start in the center of the room and work out to the sides. If you use anything buy vinyl tiles you will need a special cutter to cut the tiles that you will need smaller. That is about all I know about it. I would go with deck type flooring and you could put a few area rugs around if you need to. Or, another option is ceramic tile, but that is colder on your feet. You can use porcelain tile for screened porch. With porcelain tile, you can create a beautiful, customized look for the floor. It comes in variety of color, size and styles.